One of the most intriguing aspects of quantum mechanics remains the measurement process. An important modern paradigm for quantum measurement is the continuous, indirect measurement of quantum systems–in our case, ultracold rubidium atoms trapped by laser light. We are working towards realizing and better understanding continuous quantum measurements, with two main long-term goals. First, we are working towards implementing quantum feedback control of atomic motion, which is inherently challenging due to quantum mechanics itself: to control the state of an atom, we must continuously gain information about it, but to gain the information we must also disturb them. This is, unfortunately, contrary to our control goals of putting the ato m into a desired state. Second, we are working towards understanding the correspondence between classical and quantum mechanics, which is particularly challenging for systems that are chaotic in the classical limit. Further, understanding continuous quantum measurements will benefit future technologies in quantum-information processing and quantum-limited, precision metrology. The REU student in our group will work closely with me and graduate students on any of a variety of projects according to the student’s interests, in support of our experiments on continuous measurements of the motion of ultracold atoms, ranging from designing and constructing electronics and laser systems to theoretical simulations. 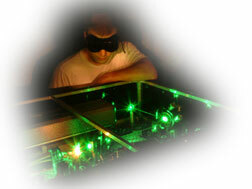 Possible projects include: developing novel, microcontroller-based hardware for timing and control of cold-atom experiments; developing and characterizing ultrastable diode-laser systems; helping to design and set up optical detection systems to track single, trapped atoms in real time; and computational simulations of optical continuous measurements on single atoms.